(a) Scanning tunneling microscopy (STM) topographic derivative image that shows the presence of line defects in v1/5 and v1/6 borophene phases. (b) STM topography image of borophene with regions composed of periodic arrangements of line defects, giving rise to new borophene phases denoted as v4/21 and v7/36. Reprinted by permission from: Liu et al., Nature Materials (2018), DOI: https://doi. org/10.1038/s41563-018-0134-1. Borophene line defects. (a) STM images of line defects in v1/6 and v1/5 borophene sheets indicated by blue and red arrowheads, respectively. (b) Relaxed structure models (top) and zoomed-in structures (bottom) corresponding to the three regions in (a). 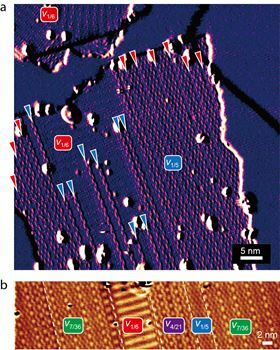 Two-dimensional boron – or borophene – accommodates line defects in a unique way, researchers from Northwestern, Rice, and Nanjing University of Aeronautics and Astronautics have found [Liu et al., Nature Materials (2018), https://doi.org/10.1038/s41563-018-0134-1]. Borophene is unlike other two-dimensional materials such as graphene in that it does not form layers in its bulk form and is synthetic. The atomic arrangement of borophene also differs from that of graphene: instead of chicken wire-like hexagons, borophene is made up of linked triangles. This atomic arrangement is punctuated by missing atoms, which leave behind a defect known as a ‘hollow hexagon’ (HH). These HHs occur in different ratios in borophene phases – for example, one HH for every five triangles (1/5) or six triangles (1/6). But an atomic scale investigation, using ultrahigh vacuum scanning tunneling microscopy and spectroscopy (STM/STS) and density functional theory (DFT), of these defect phases in two-dimensional borophene layers deposited onto silver substrates led by Boris I. Yakobson at Rice and Mark C. Hersam at Northwestern revealed something very unusual about the boundaries between these domains. Boundaries between different domains or phases in most two-dimensional materials give rise to defects or disruptions to the arrangement of atoms. In borophene, however, the situation is different. “For a two-dimensional system, where all atoms are essentially on the surface, defects may have a dominant role in affecting material properties and are important to understand in detail,” explains Xiaolong Liu, who performed the ultrahigh vacuum STM/STS experiments. Instead of causing disruption, the atoms at boundaries in borophene are easily accommodated along line defects and take up the arrangement of their neighbors. Moreover, Wang’s density functional theory calculations show that, unlike insulating defects in metallic graphene, the line defects along phase boundaries in borophene have little impact on the material’s electronic properties at room temperature. However, at low temperatures, the researchers did observe subtle differences in the properties of borophene phases, which indicates that the two-dimensional material could be tuned for particular applications. The researchers are now working on tailoring the properties of borophene using chemical functionalization and integrating the two-dimensional material with other materials in heterostructures. This article was originally published in Nano Today 22 (2018) 4–5. Unlike with graphene, the boundaries between different structural phases of borophene, a 2D form of boron, retain the material's metallic nature.